Frankie Dettori's Magic Seven Video Slot Guide & Review - Casino Answers! Frankie Dettori’s Magic Seven is a 5-reel, 25-line video slot developed by Playtech, featuring a wild symbol, scatter wins, a free spins feature, a gamble feature and two bonus games. You can play the Frankie Dettori’s Magic Seven video slot at Bovada. Bets on the Frankie Dettori’s Magic Seven slot machine are $0.01, $0.05, $0.10, $0.25, $0.50, $1, $2 and $5. You can select up to 25 paylines on the Magic Seven slot game. You are also able to play up to 10 coins per line. You can make the minimum bet of a penny all the way up to the maximum total bet of $1250 on the Frankie Dettori video slot. Frankie Dettori’s Magic Seven has an excellent betting range that will suit any casino player – from low to high stakes players. You can manually skill stop the reels by pressing the “Stop” button in the middle of any spin you make. You can play all 25 lines and 10 coins per line by pressing the “Bet Max” button. For all other bets, you can use the “Spin” button to spin the reels on the Frankie Dettori’s Magic Seven online slot game. The highest paying symbol on the Frankie Dettori slot game is the Frankie Dettori wild symbol. If you land 5 wild symbols on a payline of the Frankie Dettori’s Magic Seven slot machine, you will win the 7777 coin top jackpot. The wild symbol will substitute for all symbols except for the scatter and bonus symbols. The other high paying symbols are the other two Frankie Dettori symbols, which will pay out up to 2000 coins and 1200 coins respectively. You can win these jackpots by playing the Magic Seven online slot at Bovada! The scatter symbol is the Frankie Dettori Magic Seven Logo symbol. 2, 3, 4 or 5 Scattered Logo symbols will pay out 1X, 5X, 25X or 250X your total bet. 3 or more scatter symbols will trigger the free games race feature on the Frankie Dettori’s Magic Seven video slot. You will pick one of the three horses to win free spins. If you win third place, you will win 10 free spins, second place will win you 15 free spins and first place will get you an amazing 35 free spins! More wild and scatter symbols will be added to the reels during the free spins feature. You cannot trigger either of the features during the free spins feature. Whenever you get a win on the Frankie Dettori’s Magic Seven video slot, you can choose to risk your winnings with the gamble feature. To activate it, press the “Gamble” button. You will be given the option of risking all of your winnings to double your winnings or only risk half to double half of your winnings. There will be 5 cards laid out. The dealer’s card is on the left. Your goal is to pick a higher card. If you are successful, you will double or double half of your win. If you lose, you will lose the amount of winnings you risked. You can exit the gamble feature and save your winnings by pressing the “Collect” button. You may play up to the double up limit, which is listed in the “Info” section. Only the highest win is paid per selected payline. Winning combinations pay left to right only, except for the scatter symbol (which pays any). Payline wins are multiplied by the bet per line. Scatter wins are multiplied by the total bet and added to payline wins. Malfunction voids all plays and pays. 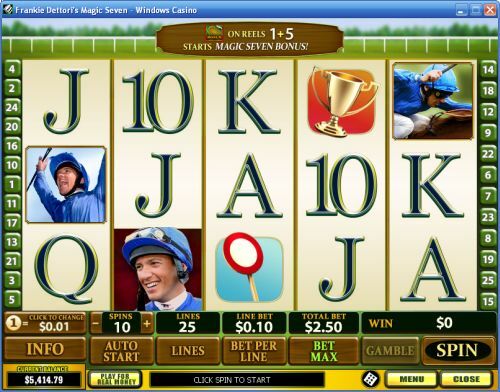 Above the “Auto Start” button, you can select up to 99 autoplay spins on the Frankie Dettori’s Magic Seven slot game. To start the autoplay mode, once you have selected your number of spins, press the “Auto Start” button. To stop the autoplay mode at any time, press the “Stop” button that is under the autoplay counter. The Frankie Dettori video slot has a great theme for sportsbettors and punters. Horse racing and slots have always gone together very well and the Frankie Dettori’s Magic Seven slot game is no exception. As far as special features go, this video slot has it all. It features two bonus games (one with a free spins feature), a gamble feature and there is also an excellent top payout of 7777X! Frankie Dettori’s Magic Seven certainly has it all and you can play this excellent video slot when you sign up and make a deposit today at Bovada! If I’m based in the USA, can I play the Magic Seven slot game for real money? 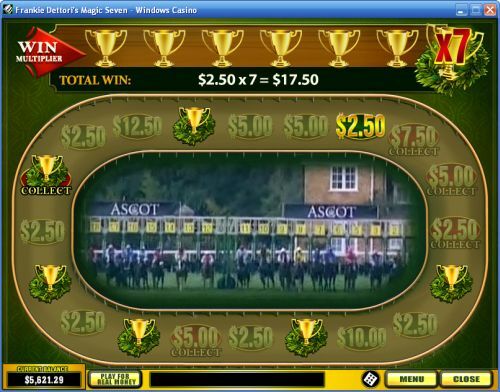 Unfortunately, USA players cannot play the Frankie Dettori’s Magic Seven online slot game for real money at this time. For a horse racing slot game you can play, please read our Derby Dollars Video Slot Review or play it at Bovada. Where can I read more horse racing slot reviews? For more slot reviews of horse racing and any other sport, you can see our list of sports slots online. Where can I play a free Flash game of the Frankie Dettori video slot? You can play a free flash version of the Frankie Dettori slot game at Bovada. You can play for free or real money. If you have any difficulties with the flash casino, make sure you have installed the most recent version of Adobe Flash Player.